UPDATE: The winner of this competition giveaway is Francesca Colomb in Devon, who entered via Twitter. Congrats to her. Poetry and music is on its way…. 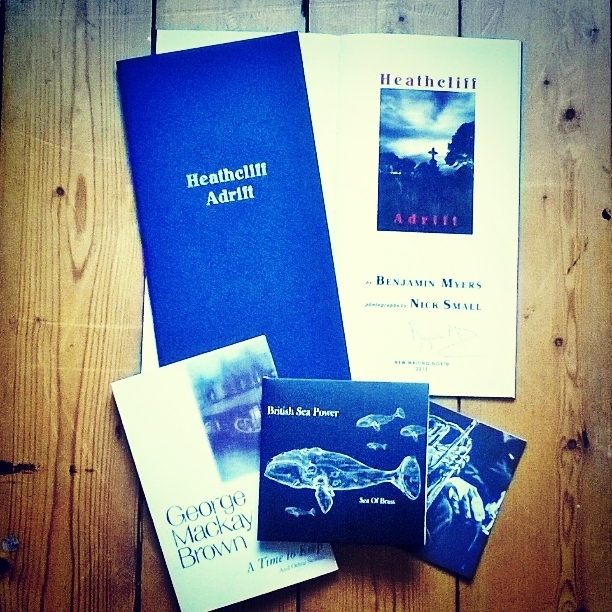 I’ve unearthed a few extra copies of the second print run of my recent poetry collection Heathcliff Adrift and am giving one signed copy away. These are highly limited and hand-stitched by Tangerine Press. The second edition features a hot foil-stamped dark blue cover (the first edition is sold out). To continue the UK landscape theme, I’ll also throw in a copy of Sea Of Brass, the new brass band collaboration by rock combo British Sea Power and short story collection A Time To Keep by George Mackay Brown, one of my favourite writers. Simply post your name in the comments section below or re-tweet the message that may have brought you here via Twitter and I’ll pick a winner at random. Along with landscape photographs by Nick Small, Heathcliff Adrift will be exhibited again in 2016. Watch this space for further details. waow, yes ! Gabriela Cendoya.